I want you to put your foot in your mouth. Portion control is a big factor in weight loss and healthy eating and –whoa, hey! I did not think you were that flexible. Get your toes away from your nose, it was only a metaphor. I just meant that your foot is about the size of a properly proportioned meal. Before I lost weight, I ate pretty healthy: cooked from scratch most days, got some veggies in there somewhere, and limited the junk food. The problem was I ate twice as much pretty-healthy-food as my body needed. I’m not exaggerating: twice as much. I like food. It tastes good and it’s fun to eat. Can I get an amen? The problem was not that I ate but that I ate again and again and again at each meal. There’s nothing wrong with enjoying your food. In fact, I encourage you to enjoy your food with undivided attention. Studies show that if we eat while we’re distracted—watching TV, checking email—we eat about 30% more than when we simply eat. Enjoy your food thoroughly, but when your portion is gone, stop eating. Eating proper portion sizes is easy to do with the measuring tools you have on you: your fists. 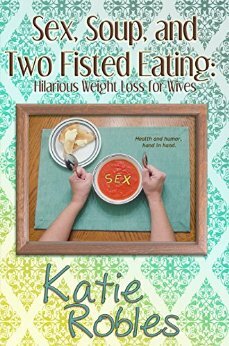 Your two fists are the size of your one stomach, so you can use your fists to quickly gauge how much food will fill your belly. A meal is equal to four fists and two of those fists should be fruits or vegetables. Four fists is roughly the size of your foot, so when you’ve put your foot in your mouth, you stop eating. I repeat: you stop eating. It’s that simple and it’s that hard. If you’re used to eating a lot, four fists isn’t going to look like enough food at first, but if you savor your food, really savor it, and concentrate on the flavors and textures, you’ll be bored with eating by the time your plate is empty. If you cut the food into small bites, it feels like you’re eating more. One study found that people who ate half a bagel cut into four pieces consumed less for lunch an hour later than people who ate the same half bagel in its full moon natural form. Another study found that eating smaller bites (nickel sized) and chewing a little longer (9 seconds) helped participants eat 65% less food than those who took larger bites (3 nickels) and chewed less (3 seconds). That’s a lot of numbers… look, forget the numbers and just make an effort to chew more and eat more slowly. The longer you take to eat, the more time your stomach has to notify your brain that it’s full. Perhaps it’s not the amount of food on the plate, but the time we spend eating that makes us feel satisfied. Metaphoric translation: put your foot in your mouth and nibble your toes. If you’re still hungry after eating two fists of food and two fists of veggies, keep thinking about feet near your mouth. Toe jam near your tongue, bunions touching your boca, sweaty soles approaching your saliva… your appetite should disappear in no time.